As a transplanted Yankee living in Texas for nearing 30-years, I still get the occasional hankerin’ for some northern comfort food. While a sack of sliders is out of the question—the nearest White Castle is in Missouri—I can find decent ginger ale with some effort. What I can’t seem to find locally is strawberry-rhubarb pie. Every spring, I jones for that unique combination of sweet strawberries contrasted by the tart, textured rhubarb. In fact, as kids we would pick fresh rhubarb, break-off the poisonous leaves, and dip the sour stalks in sugar. We would eat it until we had bellyaches, only to later learn that rhubarb is a natural laxative. If I can’t find it–then I’ll make it my damn-self. The following is a simple recipe that produces an outstanding pie with a firm–rather than runny–center. The biggest hurdle I found was sourcing the rhubarb. Few grocers stock it, and when they do, it’s stoopid pricey: around $7.00 a pound. You’ll need a minimum of two stalks at approximately $4.00—even more if you increase the rhubarb-to-strawberry ratio. Since rhubarb is a fibrous fruit and/or vegetable (it’s considered either), it adds density and protects the texture of the strawberries. The remainder of the ingredients—aside from possibly the Minute Tapioca—are likely already in your pantry, so give it a try and let us know what you think. The origins of Rhubarb date back to China in 2700 BC when the Chinese cultivated Rhubarb for medicinal use. The Italian botanist Prosper Alpinus introduced the more popular edible species to Europe in 1608. People did not recognize it as a food plant and cultivate it as such until 1750 in Germany. Europeans introduced rhubarb first to the New England region in the 1820s where it became a popular ingredient for pastry and pie fillings. Sometime in the nineteenth century it made its way south and became very popular among southerners. Rhubarb, botanically-known as Rheum rhabarbarum, comes from a combination of the Greek word Rha for the Volga River, and the Latin word barbarum, for the region of the Rha River inhabited by non-Romans. The popular edible species, Rheum rhaponticum, originated most likely in Mongolia or Siberia. It was introduced to Europe by Italian botanist Prosper Alpinus in 1608 as a substitute for Chinese Rhubarb whose roots were used medicinally. 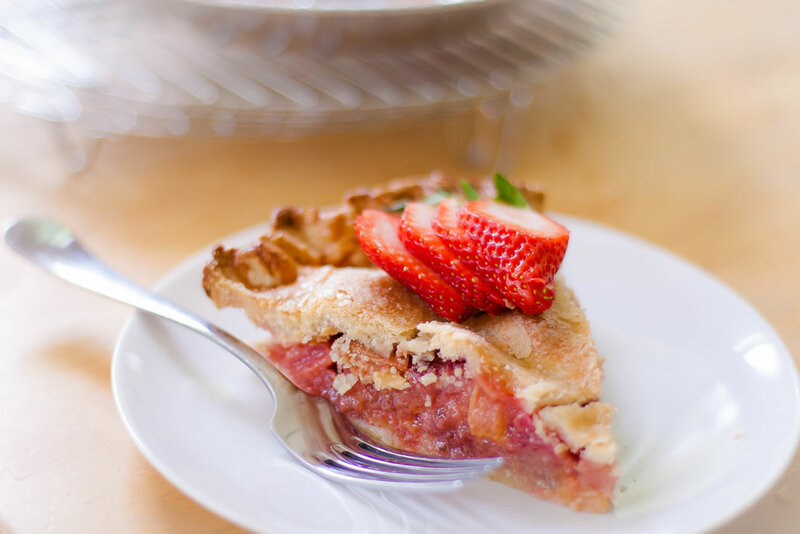 Ben Franklin is credited for bringing rhubarb seeds to the North American east coast in 1772, yet the red stalks did not catch on until the early 1800s, when it became a popular ingredient for pie. In the late 1800’s, rhubarb was brought to Alaska by the Russians and used as an effective counter-agent for scurvy. By the mid-1900s, its popularity was firmly entrenched in the New England states where it was used as pastry and pie fillings and also to make homemade wine.